Ideal location for your family, spa or golf getaway on Amelia Island Plantation. Inviting accommodations, quality decor and all the amenities you demand. This 1,200 square foot villa is decorated tastefully in casual resort decor and is walking distance to the beach (path to beach is about 100 yards away). On the fourth/top floor of the building, it is private and quiet with a balcony overlooking the pool and golf course through shady oak tree tops. The balcony has two comfortable chairs and a drink table for your enjoyment . Loveseat, reading chairs and a dining area for six. AT&T hi-speed wi-fi is provided inside the unit, and the Plantation has various locations with wi-fi. New carpet as of fall, 2016. New sleeper sofa and love seat as of fall 2016. New beds in guest bedroom as of fall 2016. The family room also features a stereo system, DVD player and VHS player. A variety of board games, cards and books are also stored in the family room for your enjoyment. Additional Information: A lovely living room/dining room area features a Taylor King sofa (with pullout double bed), Loveseat (new fall 2016), reading chairs and a dining area for six. AT&T hi-speed wirelessinternet is provided inside the unit, and the Plantation has various locations with wi-fi. New carpet as of fall, 2016. A new 32' flat screen television is in the family room. All have cable channels. The family room also features a stereo system, DVD player and VHS player. A variety of board games, cards and books are also stored in the family room for your enjoyment. I ALSO PROVIDE 4 BEACH CHAIRS, 2 BEACH UMBRELLAS, 6 BEACH AND TOWELS . The kitchen features GE appliances including a 4-burner electric cooktop/oven with microwave, a refrigerator/freezer with icemaker and dishwasher. All are in excellent condition and the kitchen is fully stocked with cookware, utensils, small appliances, dishes and more. Adjacent to the kitchen is a laundry room. ANGIE AND MATT COULDN'T HAVE BEEN MORE GRACIOUS AND ACCOMMODATING. THEY DID EVERYTHING THEY COULD TO MAKE OUR STAY AS GOOD AS POSSIBLE. THEY WERE DELIGHTFUL TO WORK WITH. 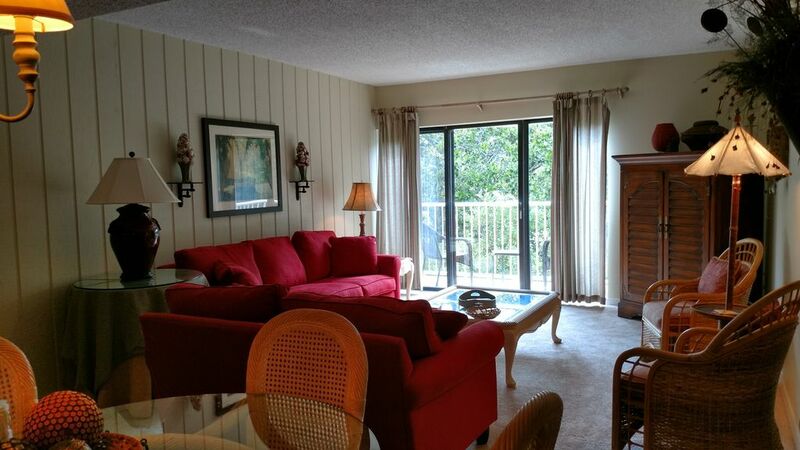 The property was very well taken care of..
Great location with easy access to the beach. Condo was clean and spacious. Amelia Island Plantation grounds are well maintained and beautiful. Two minor issues: 1) the bathrooms are due for some upgrade and 2) the plantation (better yet, the State of Florida) needs to start a recycling program with convenient curbside pick up. Better than what I anticipated! I can't say enough good things about our stay. All of the items needed [and more] to feel at home were right at our fingertips. It was great to be able to just walk across the road and be basically right there at the beach. The towels, chairs and umbrella provided were an outstanding touch! We had two friends join us, and there was more than enough room for all 4 of us adults. The pool was a nice break when we didn't feel like battling the ocean waves- just perfect. Restaurants were close, and featured awesome seafood with good prices. We enjoyed going sightseeing also- plenty of historical areas close by. We fully intend on returning next year to see the sea turtles and more dolphins!! Thank you Glen and Nancy! Other Local Activities: Boating, Basketball Court, Miniature Golf, Shelling, Wildlife Viewing, Health/Beauty Spa, Shopping, Kayaking, Racquetball.